Sharif Sehnaoui's musical journal with a focus on Lebanese (& arab) free improvisation issues & events. 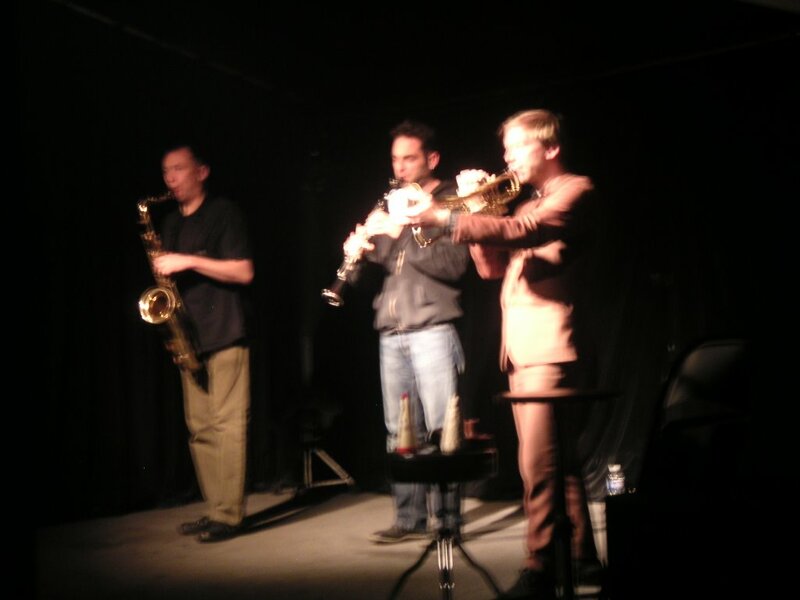 Day 1 concert 2: The Contest of Pleasures is a trio of Dörner with Xavier Charles on clarinet and John Butcher on soprano and tenor saxophones, it is probably the fourth time I see them perform, the first time being their Mulhouse concert that was later released on french label Potlach. They start the concert with a very efficient "system". Silence, then the three of them simultaneously launch an idea independently of what the other is doing, the silence again and so on, leading us to successive combinations of, for example, high frequency with slaps and multiphonics, followed by another combination of a sliding tone with white noise type breath and sharp sigle sound attacks. After a while the system opens up, leading to more acrobatic or togetherness moments with occasional simultaneous tones (maybe the only easy trick they pull out) and high frequencies that play on the eardrum through a phasing phenomenon. Then the system builds up again in an attempt to create some new and powerful music. Obviously three masters of their instruments, in the whole 50 minute set I think they gave us an overview of all the outer limit possibilities of sax, trumpet and clarinet. Towards the very end some kind of boredom can be felt nevertheless, probably because of the repetivity of the blocks proceedure and the relatively equal duration of silence that seperates them. Vortex + Bertrand Denzler in "Moments Remuements"